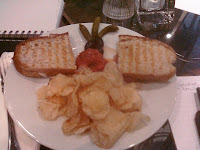 Panini @ VWC - Yum! Headed up to the Valencia Wine Company for the monthly meeting of the Grape of the Night back on the 11th. This month's grape was Cabernet Franc, and we had 7 wines to sample, ranging from inexpensive 'supermarket' wine to seriously overpriced. Cabernet Franc is one of the major black grape varieties worldwide. It is principally grown for blending with Cabernet Sauvignon and Merlot in the Bordeaux style, but can also be vinified alone, as in the Loire's Chinon. Cabernet Franc is lighter than Cabernet Sauvignon, making a bright pale red wine and contributing finesse and a peppery perfume to blends with more robust grapes. Depending on growing region and style of wine, additional aromas can include tobacco, raspberry, and cassis, sometimes even violets. Records of Cabernet Franc in Bordeaux go back to the end of the 18th century; it was planted in Loire long before that. DNA analysis indicates Cabernet Franc is one of two parents of Cabernet Sauvignon, a cross between it and Sauvignon Blanc. 2008 Courtney Benham - Diamond Mountain District Sonoma. High acid, kind of harsh. JD & I are not fans of this winemaker, who also makes wines for a couple of other labels (Angeline and Martin Ray). We find that the wines with his own name are lacking in structure and balance. 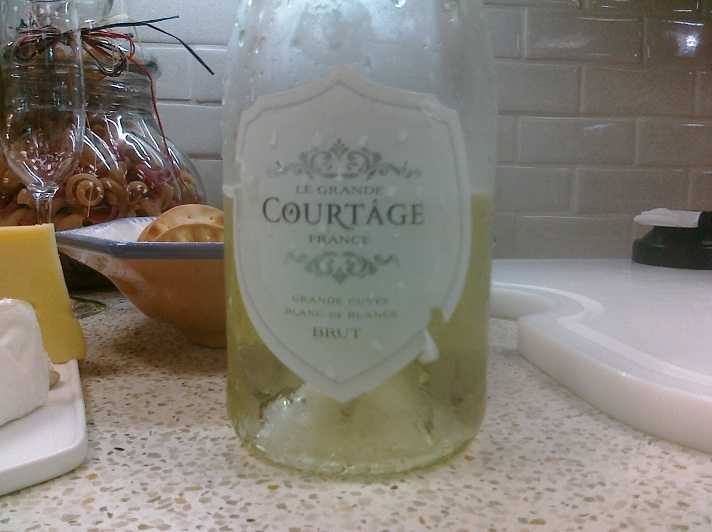 Others who tasted this wine found it acceptable. 2008 Ironstone - Lodi. This wine had more of the traditional profile for Cab Franc; a musky nose, maybe a bit of brett, with red fruit and spice in the mouth. Very nice. 2007 Buttonwood Farms - Santa Ynez. Estate grown just outside of Solvang; musky nose, medium tannins, gorgeous red fruit. Full disclosure - this was the wine we brought, and we are BIG fans of winemaker Karen Steinwachs. I love this wine. 2008 Elena - Sonoma. Plum and violet aromas with lots of cherry in the mouth. There was something bitter on the finish; couldn't really identify it. 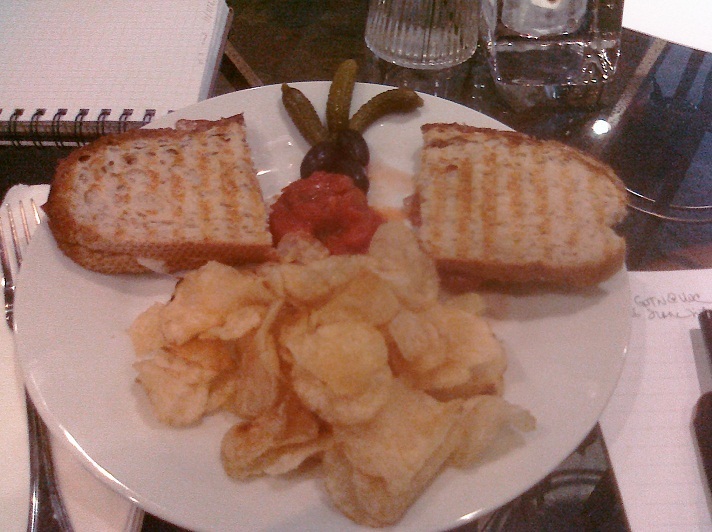 Having some food with it definitely enhanced the experience. I would drink this wine. 2009 Val de Loire Riserve Les Vignerons - Saumur Champigny, France. The nose was full of baked bread and cinnamon, but the body was bigger than I expect from the Loire, and I wasn't that happy. Rusty liked it. 2008 La Croisée - Gerald Vallee, Saint Nicolas de Bourgueil, France. Great nose, high acid and big tannins. Another surprisingly big, over-extracted wine. Perhaps the winemaker was making what he thinks Americans want? 2008 Palazzo - Napa Valley. Small production wine from newish winemaker Scott Palazzo. BIG, big, big wine, no finesse. The nose smelled of toothpaste. Seriously over-extracted. Did I mention big? Really did not like this wine. Others felt very differently. Viva la difference! As always, GOTN provokes discussion, stories and lots of laughter. Looking forward to next month. Rusty's throwing a curve - Roussanne is the grape for August! Bring your chilled whites! Thursday the 14th brought a special Bastille Day dinner by Mark Newman and Joel Fisher of WineDiscoveries.net. For me, besides the amazing food, the hit of the night was our aperitif wine, Le Grande Courtâge, a new release from winemaker Dustin LeBleu, who learned his craft at the knee of Christian Tietje of Cypher Wines (formerly Four Vines). This delightful sparkler is a blend of grapes from Burgundy and the Loire Valley - Chardonnay, Chenin Blanc, Columbard, and Ugni Blanc. It's bright, clear, fruity, and really low alcohol, so you can drink of lot of it! The 14 of us finished off a full case during the course of the evening, and also consumed the Chateau Bonnet Blanc, the Rosé and the Red Blend with dinner! And we also opened a bottle of Shai Cellars Adome, just because we could. And yet, no one was drunk. I think. All of these delightful libations accompanied Goat Cheese Beignet Puff and salad with a Balsamic Vinaigrette dressing, Giant Sea Scallops on Artichoke Bottom on a bed of Pepper Coulis, Ultimate French Roasted Chicken and Zucchini, and Tarte au Fraise with Apricots, Strawberries and Kiwis. Oh. My. Friday the 15th was opening night of the Eclectic Company Theatre's annual one-act play festival, Hurricane Season. We poured the 2009 and 2010 Saludas Tempranillo Rosé and Red, along with a 2009 Récoleta Chardonnay, to pair with Brie and Smoked Gouda and other munchies. Great opening night! We'll be back on the 22nd, 29th and August 5th to greet each weekend's opening. You should be there, too! Saturday the 16th brought a real treat. Carmageddon! We started in Pasadena and drove to Thousand Oaks - in under 40 minutes! There was a purpose. 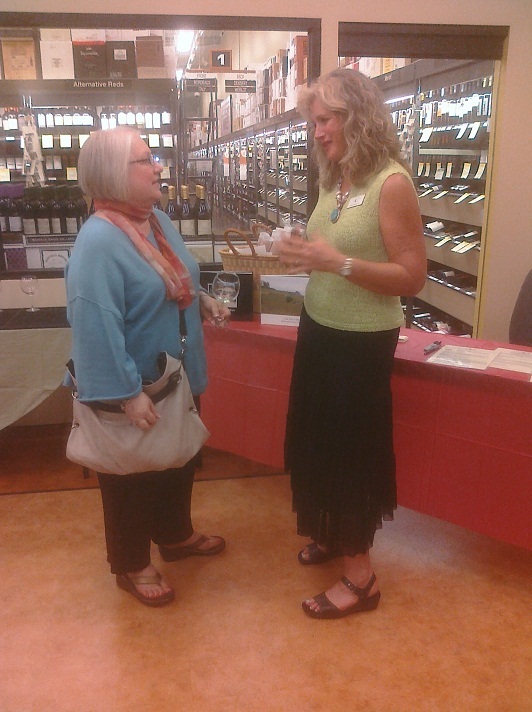 Noted and notable winemaker, Heidi Peterson Barrett, of Screaming Eagle and other 100-point wines fame, was pouring her very own La Sirena wines at the Total Wine and More. We met up with faves Shawn and Marya to taste and chat. I'd met Heidi before, and we talked briefly about wine and life and stuff. JD and I were fans of Heidi's wines long before we met her - or even knew about her! We went away with a bottle each of her 2010 La Sirena Moscato Azul, crisp dry white wine made from Muscat Canelli, and the pirate-themed 2008 TreasuRed, a blend of Cabernet Sauvignon, Syrah, Petit Verdot, Cabernet Franc, Grenache, and Petite Sirah. It comes in a treasure chest! And it's pretty yummy. From TW&M, JD and I moseyed over the WineYard and shared a couple of tastings. I did the featured tasting for $10, and John did a custom tasting for $15. Thus, we had an interesting mix. Highlights included 2 wines from the mind of Jim Clendenen. Both wines were from the 2001 Vita Nova label. You read that right - 2001. The Sangiovese was still fruity, still tannic, still really tasty. A bit of oxidation in color, but at $18.99, it was perfect with our dinner later at FAB's. The 2001 Reservatum, a blend of 45% Sangiovese, 33% Cabernet Franc, and 22% Merlot was, despite a bit of oxidation, still fresh, young and perfect. We bought a bottle of each. On to dinner at FAB's Corner Cucina, pairing our pasta and risotto dishes with the above-mentioned Sangiovese. Delightful! More exciting news to come! Stay tuned - and drink something delicious! Cheers! Enjoyed your post today! The trip to Total Wine - wish we could have come! We had a Pirate Treasured Red at Maru Sushi not very long ago, and saved the bottle. 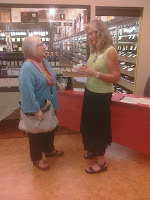 Hope to see you at the next Grape of the Night Goddess! Just a further note - Jim Clendenen just released a whole bunch of the 2001 Reservatum. The Duke of Bourbon in Canoga Park has it for $11.99/bottle or $60/six-pack. It's definitely worth buying!